Rising proudly from your countertop, the Vigo VG01009 Bathroom Sink Waterfall Faucet shows off its modern appeal in style. Its solid brass construction comes in your choice of finish and is more than easy to clean and maintain. Operating with a single hand, this faucet leaves a hand free to multitask. Product SpecificationsLow-lead compliant: Yes Eco-friendly: Yes Made in the USA Yes Handle style: Lever Valve type: Ceramic disc Flow rate (GPM): 2.2 Spout height: 4.5 in. 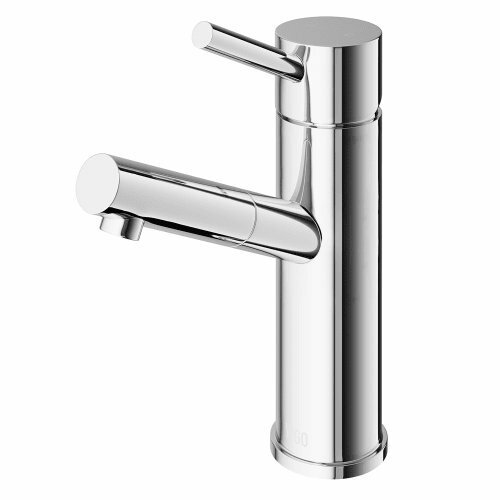 Spout reach: 6.375 in. About Vigo Industries LLC Founded just over a decade ago in Rahway, N.J., Vigo Industries has established a reputation for offering attractive, affordable, innovative, and durable kitchen and bath products. From faucets and sinks to shower enclosures and bathroom vanities, Vigo's products are designed with state-of-the-art engineering that combines efficiency and elegance. Vigo's engineering and design teams always look ahead to fulfill the ever-evolving needs and tastes of consumers, bringing them the latest styles and trends without compromising quality. Easy installation on 1 hole measuring 1 3/8 diam. in.. Solid brass construction in a chrome and brushed nickel finish. Cylindrical base and spout with slender, single-lever handle. Overall height: 6 5/8 in.. WaterSense certified by IAPMO. Easy installation on 1 hole measuring 1 3/8 diam. in. Overall height: 6 5/8 in.